Named after Dante Alighieri’s The Divine Comedy, a homely, rustic taverna fittingly lies on Via dei Cimatori, only a few meters away from Dante’s house. The restaurant offers traditional dishes based on medieval recipes. 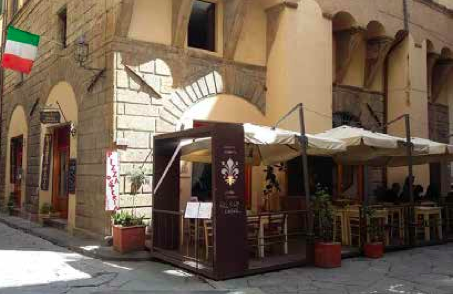 Some are adapted and revisited for the modern age in a way that one maintains the omnipresent feeling of Florentine history and tradition – so much so that Dante himself could walk in and dine next to you. Others are as they were centuries ago. Traditional medieval-style dishes include homemade ribbon pasta with wild boar and mushroom sauce, roast shin of pork with new potatoes and seasonal vegetables, risotto inspired by medieval Tuscan flavors, and tasting plates of assorted cheeses accompanied with fresh fruit and jams, including the taverna’s specialty hot red pepper jam. Also serving as a wine bar and pizzeria, the restaurant offers an eclectic selection of wines from its cellar, an outdoor summer terrace, and is fittingly decorated in a medieval style with armour and banners.